The Tank Mark I marked both the dawn of armored warfare and the start of the whole tank lineage that would soon find its treasured place in almost all armies of the world. It is important to remember that, although a weapon of war, perfected in the art of death and destruction on land, the tank also saved lives, thousands of them. This started right in 1916, when the first Mark Is helped restore the confidence of the exhausted and depressed fighting men, after facing years of being treated like meat for the butcher. This was the weapon that would unlock the stalemate and put an end to trench warfare. In reality, things get more complicated and, as crude as it was, the tank was never more than an organic part of a refined late trench warfare as a whole: New infantry tactics (inaugurated by the Canadians at Vimy Ridge), creeping artillery barrages with deadly precise schedules, better air reconnaissance and even strafing and aerial bombardments, and of course better coordination with tanks. The Mark I was the first of a lineage that stretched until 1918 with the Mark VIII Liberty, a lineage which also marked the beginning and the end of the “rhomboid” type in a period of just two years. As the famed “Little Willie” prototype is celebrated as the first practical tank, built a hundred years ago, the Mark I was the first operational tank. The Big Willie in an illustration showing the first tank being tested with a tail wheel. According to photographs, it was painted in white, a color adopted by the navy for land vehicles. The Mk.I tank was the first operational tank in the British army and in the world. It was based on the “Little Willie” (The Lincoln machine) project, supported by the Landships Committee, headed by Walter Wilson and William Tritton. It was largely an attempt to overcome the previous model’s issues. One of the solutions was to avoid adding a turret and mounted the guns in sponsons instead. The Little Willie, also known as the “Lincoln machine number one”, was tested and modified, and the lessons were taken in account for the development of the Mark I and its prototype, called “Big Willie” or, more commonly, “Mother”. In December 1915, the final prototype was ready for the first trials, which took place in April 1916. It was named officially “His Majesty’s Land Ship Centipede”, but was know colloquially as “Mother” or “Big Willie”, as a joke directed towards the German Kaiser and the crown prince, both named Wilhelm. In the meantime, the “Tank Supply Committee” succeeded the Landship Committee, under the chairmanship of Albert Stern. Other members included Ernest Swinton, the head of the committee, General Haig, who acted as a liaison officer, Hugh Elles who would later become the commander of the tank force in France. The trials were held up in an impressive reconstruction of no-man’s land with trenches, parapets, craters and barbed wire, and impressed all officers except the Secretary of War, Lord Kitchener. Despite of this, an order was secured for 150 tanks in two batches, with one order being issued 0n 12 February 1916 and another on April 23. 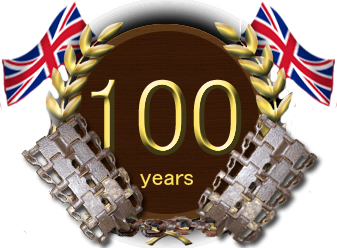 The Mk.I was elaborated to encompass all the lessons learnt from the Little Willie trials in 1915. No turret (giving a low center of gravity), armament mounted in sponsons, bolted hull made of boiler panels, newly designed tracks inherited from the Little Willie and a large, easily recognizable rhomboid hull, with the tracks surrounding the hull, making up the entire length of the machine. This shape could not be underestimated. While Great Britain learned the difficult trade of crossing heavily cratered, muddy terrain with the previous Lincoln machine, a radical solution was adopted, which proved adequate to the task, but too radical at the same time, and would emerge in postwar years. The “Mother” on trials. It was made of boiler plates, chiefly to speed up construction. Following Mark Is had hardened steel plates. Indeed, a running track of this size allowed to gap the largest known trenches of the time, negotiate craters, while the front three meter recess allowed the vehicle to climb almost any obstacle. But, in addition of being heavy, these full-running tracks caused a safety problem for the crewmembers, who could get caught in it and be dragged under the tank. It also limited the ability to store anything on top, save for a narrow portion of the central hull. Visibility was perfectible and a lot of space was lost by cramming all the return rollers. A nightmare for an engineer, as well as the maintenance crew. Propulsion relied on a six cylinder petrol engine at the rear of the hull, with no compartmentalization, due to the transmission system tunnel, which ran through the tank and, more importantly, because, at that stage, the engine was relatively untested and finicky enough to force engineers to need to be able to get their hands on the engine just in case. In addition, the engine had to push quite hard to carry the 28 tons of steel with its just 105 horsepower, with a crushingly low of 3.7 hp per tonne. Not surprisingly, the burden was made greater by the incredibly sticky nature of the mud, which was shown by recent studies to just stick to metal, which meant a tremendous force was required to extract whatever was plunged in it. At least in the case of the tracks, the flat shape and serial arrangement made it more likely to “surf” on the surface, although taking along a large amount of mud in the process. Being clogged in a sinkhole was just the level of effort which the valiant little Daimler was not ready to undertake. Breakdowns were commonplace and ruined the early stage of the assault, largely diminishing the number of tanks that just had the luck to make their way into the no-man’s land and reach the destination. Also, the engine not being separated from the fighting compartment proved ruinous for the crew, which fell ill quite quickly, but that feature remained unchanged until 1918. 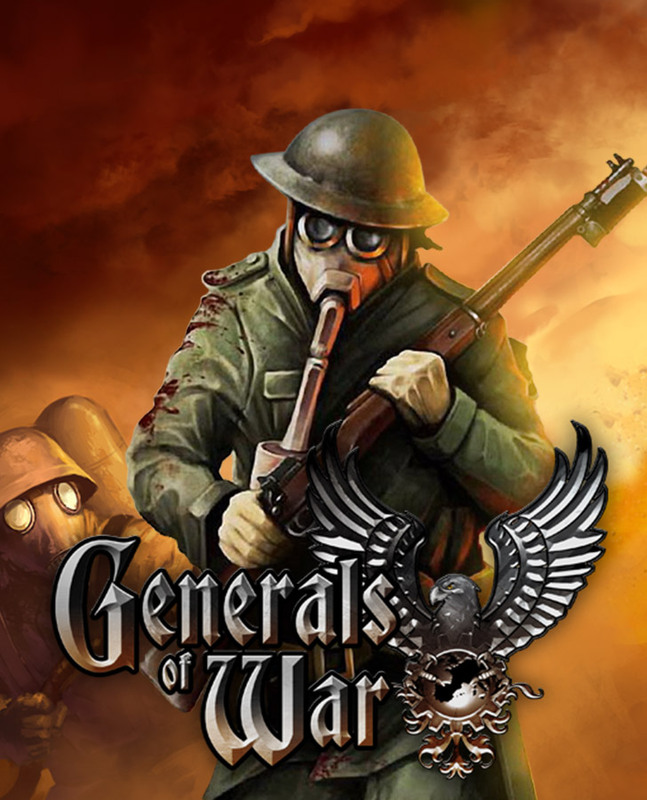 The general staff didn’t see this sickness as a limitation either, given the relatively short distance which had to be crossed between opposing trenches. A mobility aspect which was incorporated into the design concerned the removable sponsons, allowing the tank to be narrower and thus, providing easier transport by rail. The crew comprised eight men, of which two were drivers (one for the gearbox and the other for the brakes) and two others controlling the gears of each track. This system needed perfect coordination, which was difficult due to the noise inside and the protective leather helmets they used. The four others were gunners, serving the six-pounders and the machine guns, depending on the armament. 50% of the Mk. Is were armed with two guns in the sponsons and three machine-guns (two in the sponsons, one axial in the hull), named “males”, and the other half were “females”, armed with five machine-guns. These were either Vickers models or the 8 mm (0.31 in) Hotchkiss air-cooled equivalents. The tanks were quite big, weighing 28 tons with an eight meters long hull and an overall length of nearly ten meters with the additional tail wheel, another feature kept from the Little Willie. It was designed to help crossing very large trenches, but later proved impractical and was dropped. No less than 150 Mk.Is were built at William Foster & Co. of the Lincoln Metropolitan Carriage and Metropolitan Carriage, Wagon & Finance Co. at Wednesbury. The first order of 100 was increased to 150 in April 1916, acting as a pre-series for further mass-productions. The Foster deliveries concerned 37 males, while Metropolitan Carriage, Wagon, and Finance Company, of Birmingham, delivered 113 Tanks, including 38 “males” and 75 “females”. Later on, two rails were mounted over the hull to handle a wooden beam, used for unditching. The first were ready in a hurry and deployed in August, just in time for the Somme Offensive. 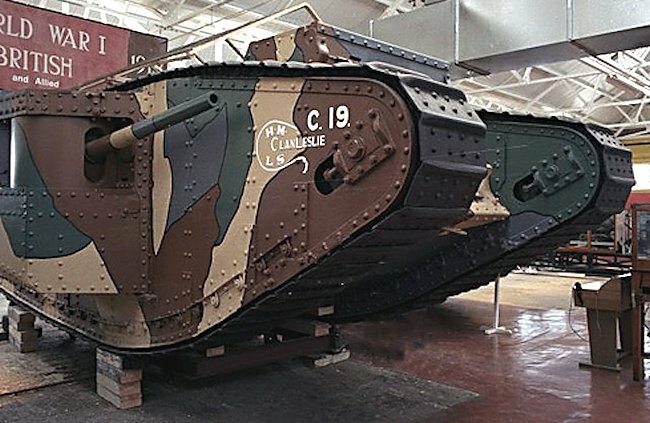 From the end of 1917 and until 1918, some of the surviving ones were converted as signal tanks with a large antenna at the base of the driver’s cab, participating in the battle of Cambrai. Others were converted as supply tanks. As the Mark I showed many limitations, the next batch of 50 tanks (25 females and 25 males) were built at Foster & Co and Metropolitan for training purposes only. There were some claims about their unhardened steel plates, but all data seems to show that the Mk.IIs were regular Mk. Is with a few modifications for training purposes. Some 20 were sent to France for advanced training and those left remained at the Wool training ground in Dorset. However, in 1917, there weren’t enough tanks operational for the offensives planned in April 1917 near Arras, and twenty surviving Mk.Is and all the Mk.IIs remaining in Britain were put in action (despite some protests), suffering high casualties, mainly due to the new armor-piercing bullets the Germans employed. The Mark IIIs were training tanks as well (the great improvements were still planned for the Mk.IV) and were all fitted with Lewis machine guns in smaller, lighter sponsons. Otherwise, few changes were visible at the beginning, as this batch of 50 vehicles was designed to incorporate all the Mk.IV improvements. Deliveries were slow and none left Great Britain. Their first operational use was in September at Flers-Courcelette, but this first attempt was a near disaster. Most of the tanks broke down on their way, others bogged down in the mud. However, despite the lack of training of their crews, some managed to reach their designated objective, if only too few. Only 59 were part of this attack, most of them being captured afterwards by the Germans. The first issues quickly arrived at the War Office. When they appeared however through the fog, they had an uncanny psychological effect on the German troops, which fled their trenches, leaving their machine guns. The distant roar and clinging of the tracks, and later the slow-moving masses emerging from the fog which resembled nothing built yet were enough. But their ability to take punishment and return fire was compelled by the fact the Germans were caught completely unaware of their existance. A real surprise achieved by the well-guarded secret behind the name that stuck ever since, the “tank”. The noise, the smell and the temperature that reached nearly 50 degrees Celsius were just unbearable. There were powerful emanations of carbon monoxide, cordite, fuel and oil vapors, all made worse by poor ventilation. The crews often opened the narrow door situated just behind the sponson, in an attempt to get some fresh air in. With poor training and almost no internal communication, steering was enormously difficult, resulting in mechanical over-stress, causing many breakdowns. Another factor was the petrol engine, overwhelmed by the weight of the hull combined with the very sticky, heavy mud typical of the region, something that was rediscovered when excavating and experimenting with the supposed battlefield of Agincourt. Coordination between the tanks also proved inadequate, theoretically by using a set of fanions, flags, lamps, semaphores and other devices inspired by navy practice. There was no radio on board. Pigeons were used instead to report positions and status with the General Headquarters. Crew security was also an issue inside the tank. If the 8 mm (0.31 in) plates were proven bullet proof, each impact produced mini-shrapnel inside the hull, injuring anybody inside. Following the first reports, thick leather jackets and helmets, or a combination of leather and chain-mail, were provided to the crews. Spall liners only appeared decades later. Despite its historical importance, which could already be perceived in 1916, only a single male survived. The world’s oldest surviving combat tank is showcased at the Bovington Tank Museum, in static display. Its Number is 705, C19 and it was named “Clan Leslie”, but both its true identity and wartime history remain a mystery. It was suggested that it might have been used as a driver training tank, numbered 702, the second Mark I built. 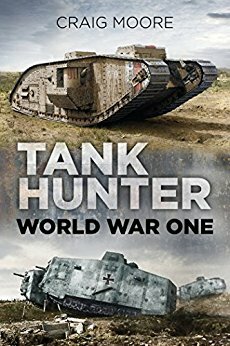 It was discovered laying in 1970 in the grounds of Hatfield House, the world’s earliest proving ground for tanks. 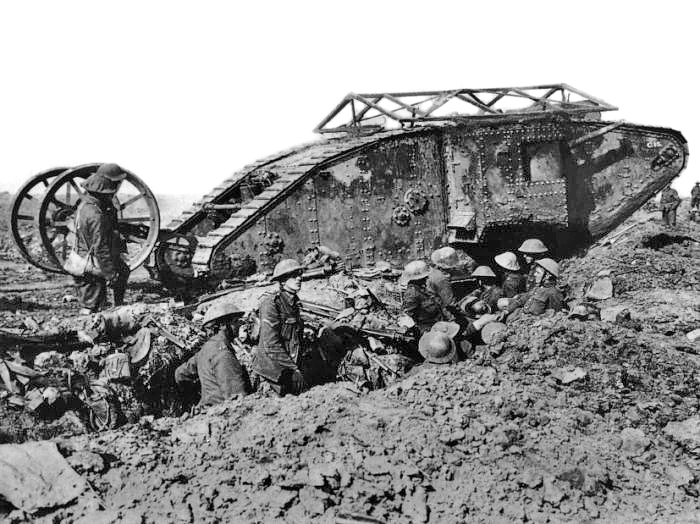 The irst engagement of the Mk.I at Flers Courcelette, 15 September 1916. Despite their poor performance, the tanks were increasingly popular among soldiers, with propaganda and songs talking about “miracle weapons”. The “Mother” prototype in trials by April 1917. The hull was made of resistant boiler panels which, along with poor ventilation, kept the interior very hot. Proof against normal infantry weapons, it was sensible to machine-gun rounds and could be disabled by field guns and specially-crafted armor-piercing bullets. A wooden and wire mesh frame was added to the roof of the Mark I tank to deflect hand grenades thrown at the tanks by the German infantry. The Mark I Male tank was armed with a 6pdr gun and three machine guns. On 15th September 1916, 2nd Lieutenant J.P. Clark commanded this Mark I Male tank No.746 in C Company, Section 3, Heavy Section Machine Gun Corps (HSMGC). It was later given the unit number C15. It crossed German trenches and returned to Allied lines at the end of the day. 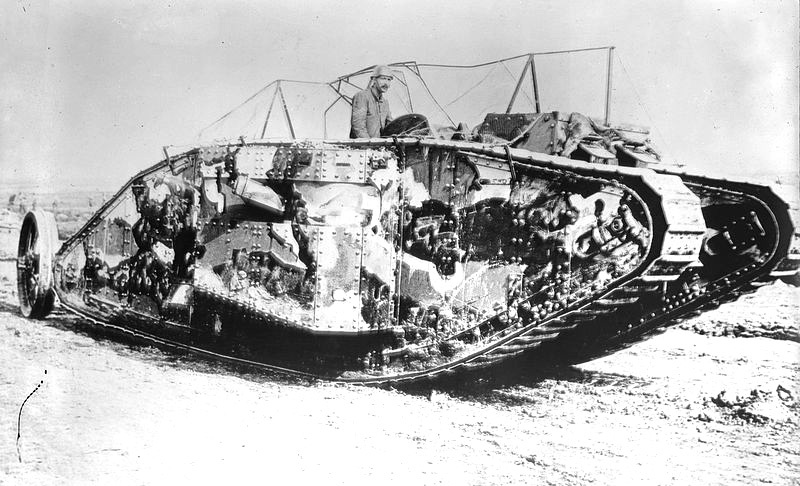 Mark I Female tanks took part in the Battle of Flers–Courcelette on 15th September 1916. They were armed with four 0.303 in (7.62 mm) Vickers water-cooled machine guns in side sponsons and a 0.303 in (7.62 mm) Hotchkiss air-cooled machine gun in the front cabin. A two wheeled steering tail was attached to the rear of the tank. Tank No.511 was commanded by 2nd Lieutenant E.C.K. Cole on that day as part of D Company, Section 4, Heavy Section Machine Gun Corps (HSMGC). It was given the unit number D25. It engaged the enemy and returned to Allied lines at the end of the day. Mark I Female tank No.523, C20 under the command of Lieutenant MacPherson, C Company, Section 4, Heavy Section Machine Gun Corps (HSMGC) was due to be part of the attack 15th September 1916. Like many other tanks, it broke down. It was repaired by the afternoon and tried to catch up with the advancing units. It had to be abandoned on the battlefield on 16th November 1916 after it ditched and could not get out. 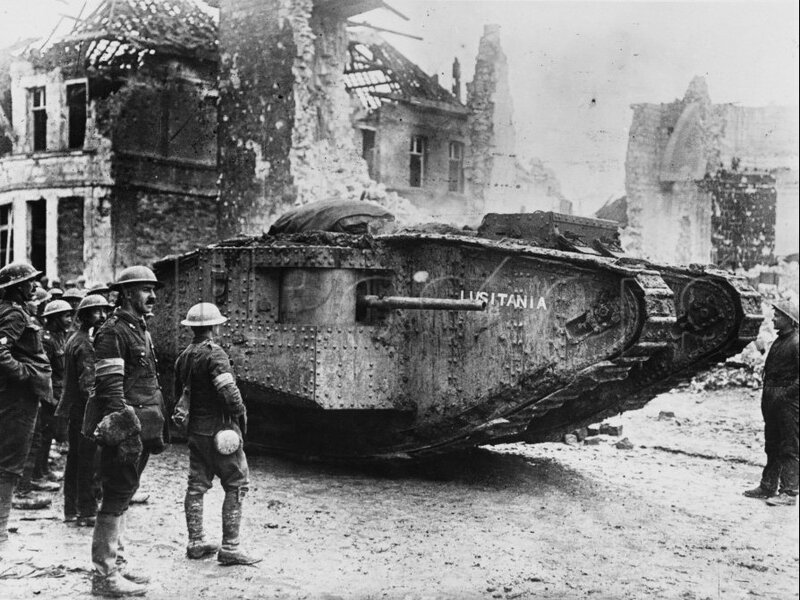 This Mark I Male tank No.745 saw action on 15th September 1916 as part of D Company, Section 4. It was given the unit number D22. Lieutenant F.A. Robinson commanded the tank. Unfortunately, the tank crew mistook some soldiers as the enemy. They fired on and killed some British troops. The tank ditched but managed to get out. It returned back to Allied lines after the battle. It was back in action again on 26th September 1916 attached to C Company. It was hit and destroyed. The rear tail could be locked in the up position when necessary. The three ‘A’ shaped bits of metal on the roof were used when the sponson needed to be removed for rail travel. Some Mark I Male tanks were used as supply tanks. This is tank, No.712 called ‘Dodo’, was part of B battalion, 5 company, 8 section, B37. It was photographed 7th June 1917 at Messines. This was the first time old Mk.I tanks were used as supply vehicles. This tank was later renamed “Badger”, it presumably remained with “B” Battalion until the Mk I and II supply tanks were withdrawn. What a great informative website! Thanks Ben! We are continuously updating, researching and writing new articles. Haha, just notice the date this was posted is September 15, 2016. the date of the battle of Fler-Courcelette is September 15, 1916. Hello, I noticed there are multiple links on the “Little Willie” which leads to a nonexistent page, just thought I’d give a heads up! what about the version with the red and white on front? Hi all I have a brass uniform button which has the motif of the mark 1 tank. Can anyone tell me what the uniform was accosted with. Obviously it’s not the normal Tank Corp button?